After graduating from Yale, William Baker, scion of an old line patrician family, goes to work in presidential politics. But when the campaign into which he’s poured his heart ends in disappointment, he decides to leave New York behind, along with the devoted, ambitious, and well-connected woman he’s been in love with for the last four years. 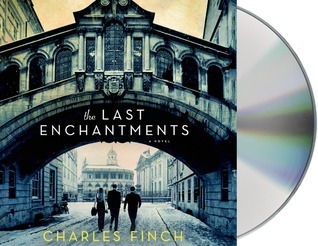 THE LAST ENCHANTMENTS by Charles Finch, read by Luke Daniels is a Fiction. Audio Version. A compelling tale of friendship, heartbreak,love, loss and growing up. While, I had a hard time connecting to the characters, it was an interesting tale of secret longings, desires and finding one’s self. Mr. Daniels’, voice is vivid, and interesting. This is a tale of time between youth, and adulthood. A time of growing up, finding first love, tragedy, unrequited love, using Oxford University campus as a backdrop. As I said above I had a hard time connecting with the characters. I don’t totally understand why, as this is an interesting tale of growing up and the transition between adolescence and adulthood with all the issues and problems life brings in between. Received for an honest review.